“We’re outnumbered,” said Blago, an Omis solider. On top of fourth level of the fortress Mirabella in Omis, it became clear the Turks troops, who snuck in through the Adriatic Sea then the Cetina river, would easily see victory today. Few men in Omis stood for honor – many were pirates or would be pirates. The few who did stay stood in the fort ready to die. The defenders began to take out the Turks one by one. The Mirabella fort, which stood constantly overlooking the villagers, now protected them from the foreign invaders. The view from the Mirabella fortress made shooting easy, and as each man fell, the Croatians yowled in victory. After hours of fighting, the Turks retreated although they still by far outnumbered the Omis troops. Loud echoes off the valley made it sound as if thousands stood to protect Omis rather than a handful. This lucky turn of events stands as a testament to the luck of those who get to live in this bewitching Croatian town. As I went to quickly capture this second photo from the fortress of Mirabella, I felt a sense of urgency as the golden light of the sunset quickly began to fade. It’d been a difficult journey for me carrying all of my tripod and panoramic head along with other gear up a medieval path to the high point of the Mirabella fortress, but I knew with enough speed I’d get the shots many dream of taking. As the moment of truth slowly faded before my eyes, I captured this image with 4 vertical shots. 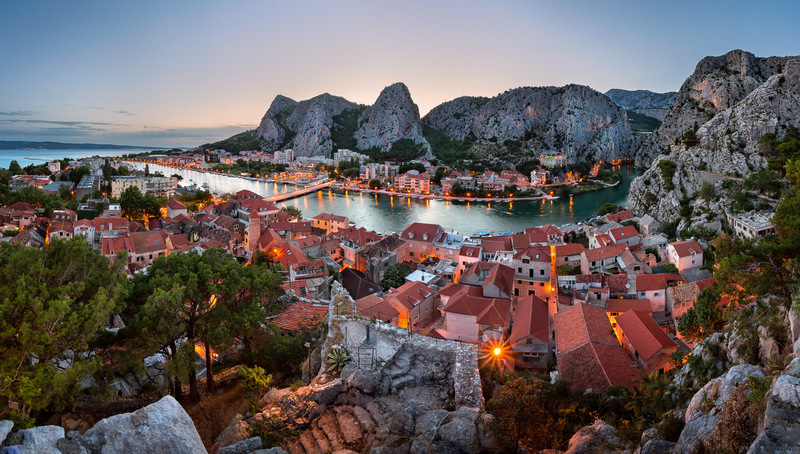 The perfect lighting with the mixture of natural sunlight and artificial illumination with the lamps mixed with Old town Omis, the Adriatic Sea and the Cetina River make this panoramic photograph deliciously surreal.